Is There A Natural Bat Repellent? I have good news. You can get all the bats out of your house safely, in an environmentally sound way, and ensure that they will never come back. 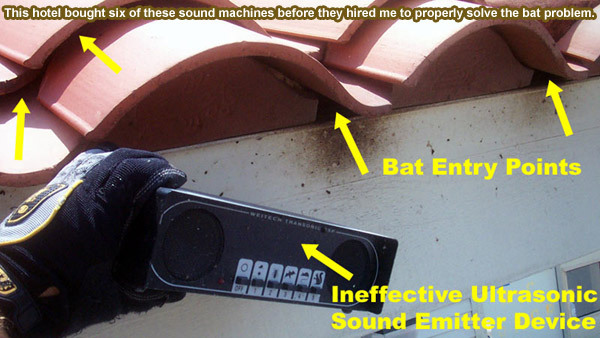 Now the bad news, which is actually not bad at all - there is absolutely positively no effective bat repellent product (spray, powder, granules) or machine (light, noise) that will make bats leave your attic or anywhere, for that matter. There is a free natural home remedy however, and it's the ONLY way to remove all the bats from an attic: with a proper bat exclusion. This method is the easiest, most efficient, and most effective way to permanently remove all the bats from your attic. Other methods, like bat poison or bat traps only make the process more difficult, messy, and hard on the bats. And most of all, these gimmicks simply don't work. Same goes for bat deterrent products and devices, which I will now analyze for your research. Though there is no registered bat repellent there are many forms of repellents sold to try keep bats away. These products are even sold at stores like Home Depot and Lowe's. While these repellents have been purchased by many people their overall record is not the best. There are a few problems with these repellents. The first one is that they will not work on any bat; they will simply act as if the repellent is not even there. In the rare cases when bats temporarily leave for an hour or so due to some disturbance, your problem is not solved, because once bats have found a home they always keep coming back. 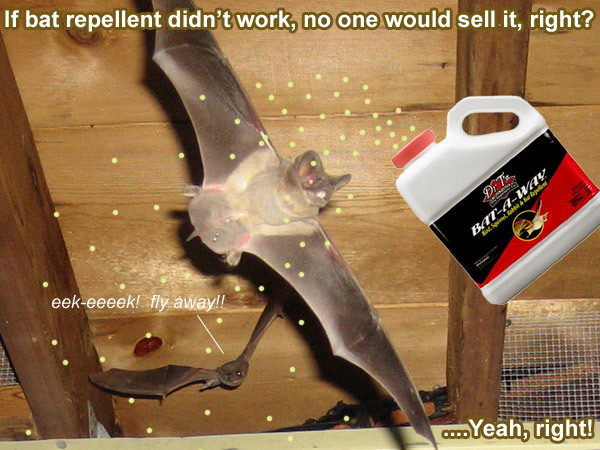 Naphthalene is one of the bat repellents that do show some effectiveness at making sales as an all-purpose wildlife removal, but that does not mean that it is a good idea to use it. The problem is not that naphthalene is not semi-effective, but rather that it is dangerous to both animal and human life. Another problem is that as stated earlier, even if you use 500lbs of moth balls, it won't affect the bats, and if it did, bats will come back home once the repellent dissolves and naphthalene does just that. Finally, another problem of naphthalene as a bat repellent is that the smell is strong and touching it can trigger sensitivities to the substance. Because it is best used in closed spaces that means that when a person goes into that area they would be exposed to it. Bright lights have been used and in rare cases they have been effective when placed by the entry points. There are two problems with using bright lights as a bat repellent. The first one is that it rarely works, as some bats will quickly get in and avoid the lights even when there are lights inside by heading to dark corners. There is also a second problem which is that bright lights can attract other types of pests such as mosquitoes. If you do not have the bats then you will miss them as some eat up to a thousand mosquitoes per hour. It is also true that many people will try to use high pitch noise makers. These are many reports that these do not work what so ever. Additionally, the FTC has warned that these ultra-sonic emitters do not work. Are there any natural homemade recipes for bat repellent, so you can do it yourself without harming the environment or bats? No! Again, the most ecologically sound, most legal, and by far most effective (only real effective) way to solve the bat problem is with a live exclusion. So if you want, go ahead and mix up a special homemade brew of cinnamon, peppermint, coyote urine, human hair, and green tea and spray it in the attic. Hang some prayer crystals while you're at it. Then when nothing happens, it's best that you do the job correctly. Learn about the biology of an Evening Bat. How Are Bats Getting In? Bats do not need a lot of space to get into a building. In many cases a hole as small as ¾ of an inch is more than enough to make their way inside. Bats will also prefer entrances which are higher up as they are easier to find for them. Once the bats are inside they can make their way to areas of the house such as the attic, the walls and the chimney. The chimney in particular may be a common entry point as it is difficult to find structural damage inside unless you are being assisted by a professional. Such structural damage could be really small and difficult to see even with the use of mirrors. You may be tempted to place bat repellent in these areas, but there is more that you need to know. If a bat repellent is not working then that is because it is not the most effective method for removal. Poisoning is out of the question as it is illegal in almost all of the US. Trapping and relocating is not only dangerous but also very rarely works as they generally come back home. So what is the most effective way to control bat population? The one effective thing that you can do is to wait until all the bats have left and seal the entrance. There could be several entrances into your property which bats may be using. It is important that you find all of them and seal them when the bats go out for food at night. The bats may remain outside of your property, but at least they will not be inside. Before you decide that you want to use a bat repellent you should ask yourself if you really want them gone. Bats serve a great purpose in controlling mosquitoes and pests because they are the bat’s food source. If you have them in your house or business however it is understandable that you may want them outside. In those cases removal by extraction and sealing off the entrance is the best way to get the job done. Waiting until all the bats have left and then sealing all the possible entrances is the best and only way to keep them out. The job is very detail oriented and experience is necessary to find the entry point for the bats. But without proper knowledge, one attempted solution a lot of people try is the use of bat repellents.